The area of low pressure that we've been watching for several days has now organized enough to be classified as a tropical depression. It may be upgraded to storm strength today before moving into the Yucatan peninsula late today / tonight. The current threat is from heavy rainfall. 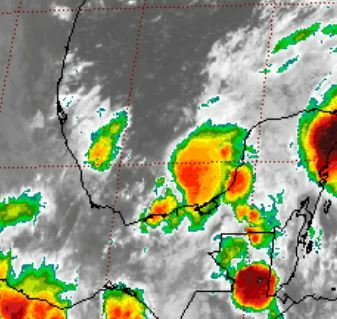 As of 5 AM EDT / 4 AM CDT Tropical depression 9 was centered at 19.4 N /92.3 W or 120 miles WSW of Campeche, Mexico. It was moving east at about 6 mph. Top sustained winds are estimated at 35 mph. Pressure was estimated at 1000 mb. Tropical depression 9 will strengthen then move into the Yucatan peninsula. Restrengthening is likely over the northwestern Caribbean later this weekend and into early next week. Interests in the NW Caribbean should monitor this situation closely.